My day started early: a 6:30 departure from Chuncheon through a thick blanket of fog resting in the valley. 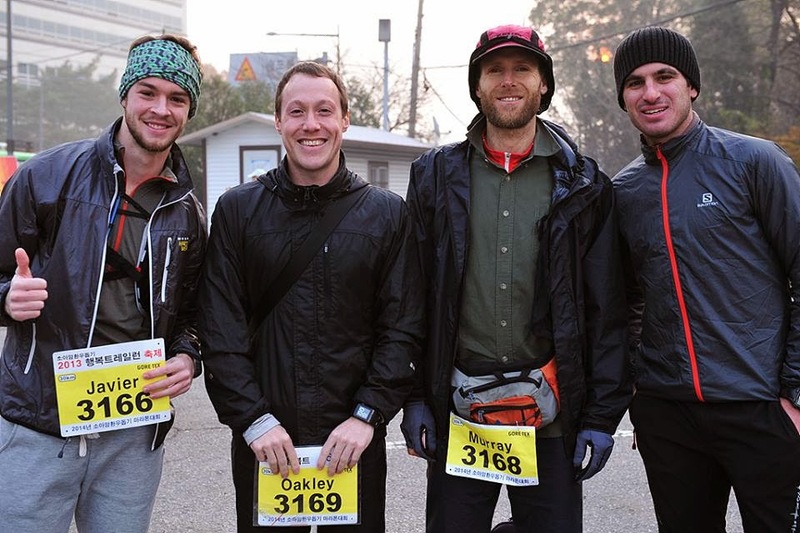 I was worried that the fog, which kept me going about half the speed limit, would slow me down too much to make the 8:30 starting line at Suseo Station in Seoul. But as soon as the highway took me up into the mountains, the fog cleared, and it was an easy, speedy commute. Full cup of coffee and some URP to get psyched, and I was at the station just before 8. 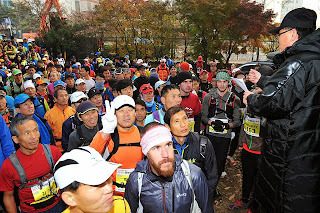 Thanks to the micromanaging elbow grease of Javier, we had a fairly large group of Trail Running Korea folks-- eleven or twelve-- amidst a field of a hundred and fifty odd runners. 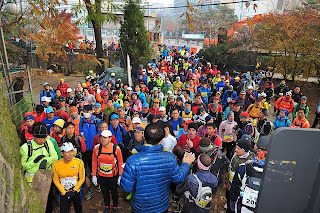 The sky was overcast, it was pretty cold, and the gathering at the starting line was comical-- a horde of brightly dressed athletes clambering to start up one single track trail. Rather than deal with what would inevitably be an hourglass-esque start, I made my way to the front, just to get a jump on the crowd. I picked a somewhat sketchy route right up the first climb, and immediately got out front. I had no intention of staying there, but it was a good feeling getting up the first pitch in front, completely avoiding the bottleneck below. Speedgoat Yann was up there, of course, along with two other fleet-footed runners. I slowed down into a more sustainable pace, and Yann and company powered along, disappearing up the mountain. Jared and Tibbs, smiling before the grimacing! Yann is intensely focused on the line up the first climb. Dashing up the start to avoid the bottleneck. I was in the lead for about two minutes! woot! My plan going into the day was a bit of a test: It's a 30km run, so if I pushed it early could I manage to hang on? Time would tell. I speed-hiked the climbs and took the descents as quickly as I could. I would look back periodically and see where the field was, and it was clear, after the first climb, that it was thinning out. 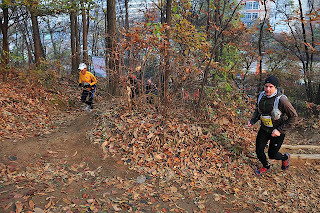 Tibbs was right behind me and she caught up, and we ran together for most of the climb up to Dueryeongsan, the second peak of the day. Descending felt great, I felt pretty nimble on the feet, and was quickly picking lines down some semi-technical sections mixed in with some very flowy, hard packed single track. I looked back, and saw pink, but this time, not from Tibbs, but another foreigner who was moving super efficiently through the forest. I let her pass and followed her through the slowly descending forest, bringing us out to the first transfer. At this point, I was sweating up a storm, so decided to stop, take off the jacket, remove my race number and then re-pin it on my jersey, an affair that took around three minutes-- an opportune moment to relax, take stock, and ready myself for the next leg, a 1900 foot climb up to Cheongyesan. This section was an unrelenting stair climb, and I just dug in as best as I could, even to this point probably operating at 90% capacity. After what seemed like hours summiting this beast, the trail wound its way along a rocky, undulating ridge, until making its way up Isubong where the out and back section of the course began. Still feeling fantastic, I made my way out to see the leaders come by, looking strong and moving steadily, Yann and Murray among the top five. I made the turn, surprisingly, just minutes behind them, but all of a sudden, I was attacked by these intense cramps in my hamstrings and my quads. 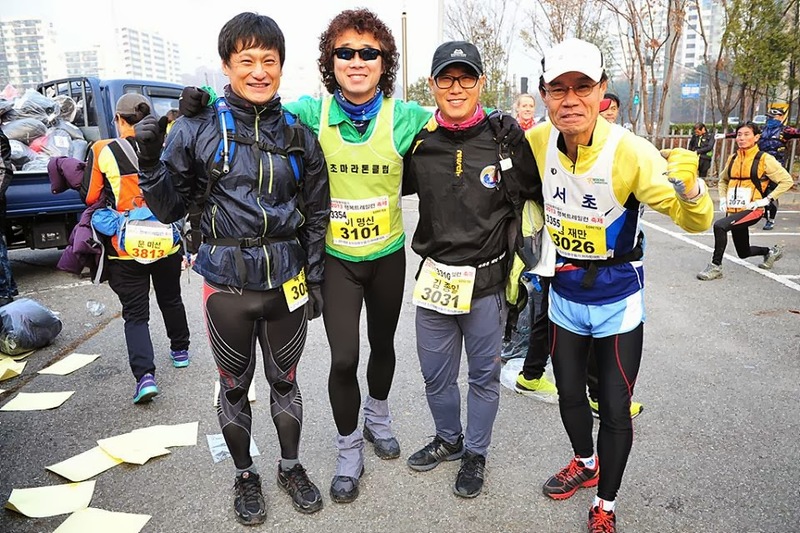 I had noticed some tension in my hamstring on the way out, but I thought that was just a result from all of the climbing and thought it would work itself out once I got running again. But these cramps were intense, causing my legs to either seize or to charley horse. I had to stop several times and just try to lengthen the muscles out with stretches; but each time I got going again, they would cramp. I didn't want to stop, especially at this stage, because this was where I was passing the field behind me moving quickly in the opposite direction, giving me a adrenaline boosting visual of the vast number of racers who were in hot pursuit. But there was nothing I could do! Tibbs passed me and gave me some dried mangoes and a granola bar, and I got a few salt pills from Jared as he passed on his way out to the turnaround. And I basically walked until I could run again, and when I ran, I was forced to run slow. This has never happened to me in a race, and I was pretty sure it was a salt deficiency, so perhaps the salt tablets gave me some confidence that the cramps would resolve. As we reached Isubong, we started the descent to the second road transfer, and I fell into a small group of runners moving at a blistering pace down the mountain. Soon my cramps were forgotten, and we made our way through a heavily populated trail, yelling out for heads up to all of the hikers. It became this really exciting foot race, and the hikers became cheering spectators, lining the side of the trails, really enjoying the spectacle we made plummeting down the mountain. Everyone was courteous and made way for us, and we continued down until reaching the road and the second and final transfer. As soon as I hit the road, I instantly realized that my speed antics down the previous four kilometers had all but trashed my legs. The cramps had come back, and I fell into a slow shuffle, drinking lots of water, taking more salt and eating a gel. I felt a bit disheartened, feeling this trashed, but was hoping the nutrition and water would prop me up for the final section. Javier, looking in fine form, caught up to me as I shuffled along, and I tried to tag on to him. Lucky that I did, as soon we saw Murray, standing on the side of the trail, unsure of where to proceed. Apparently there was a very vague trail shooting up the left side of the mountain, and the turn sign was buried under some leaves. I would have definitely missed it. Javier had done some reconnaissance the week before, and assured us that the turn would get us to where we needed to go. I was actually skeptical, as the course, up to that point, had been marked brilliantly. At this point Martin, another runner, had joined us, and I was ready to run a bit down the road past where Murray had been. But then up from the opposite direction came Lina, the girl in pink who had passed me on the first descent. She had been a ways down the road and hit a dead end. 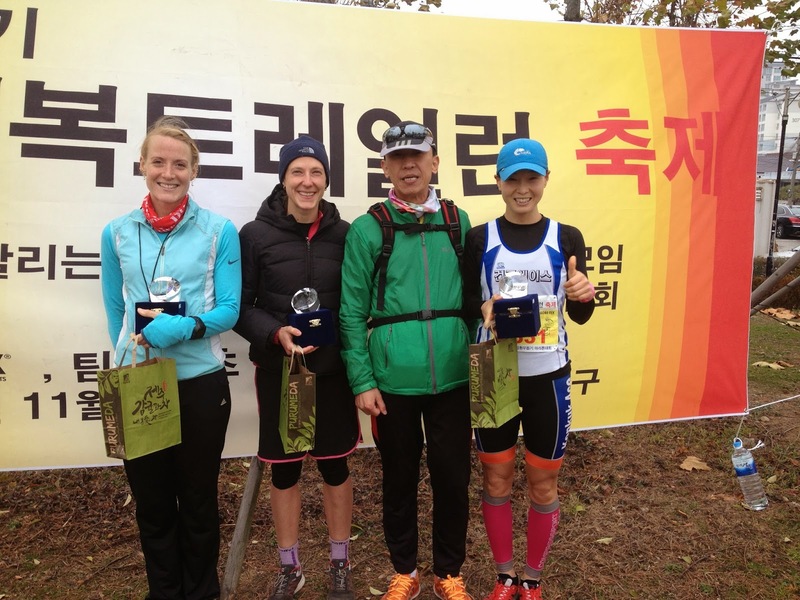 (Even after the extra kilometers, she still went on to take first in the ladies race). So we all set off up the trail, completely covered by leaves. The Korean Scott Jurek and fellow trail crushers! 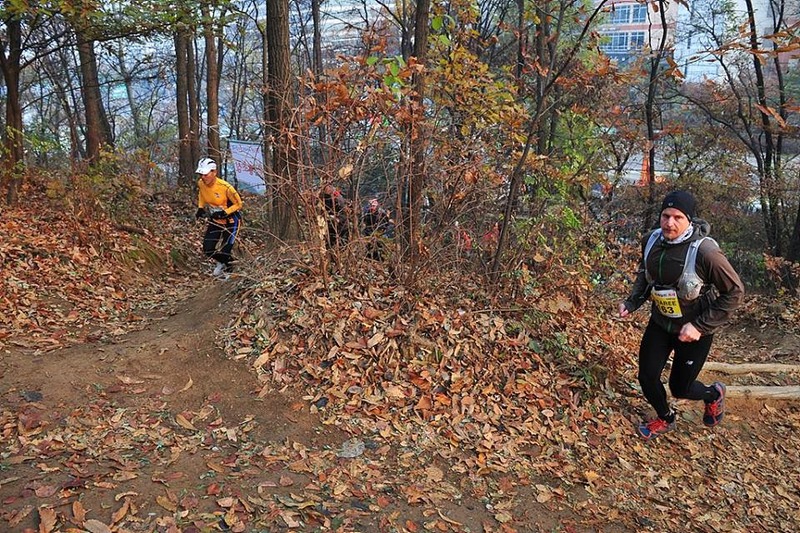 This final climb up to Inuengsan wasn't far, just a 700 foot climb, but it was steep. I had nothing in my legs, and Javier, Murray, and company moved out of sight pretty quickly. Eventually, I reached the ridge, and resumed my slow shuffle to the peak. My cramping legs never really recovered, but I managed them by keeping a slow pace. I was pretty bummed that I couldn't use my resources to lay down the hammer on this last section, but slow and steady got me to the finish in a respectable time and I was overall quite pleased with my Happy Trails race, finishing right at 4:00:36 and good enough for 11th place. Yann, Murray, Javier, and Martin were all top ten. Tibbs finished second among the ladies. Everybody made it in, so an overall stellar effort by the Trail Running Korea contingent. The cramps. 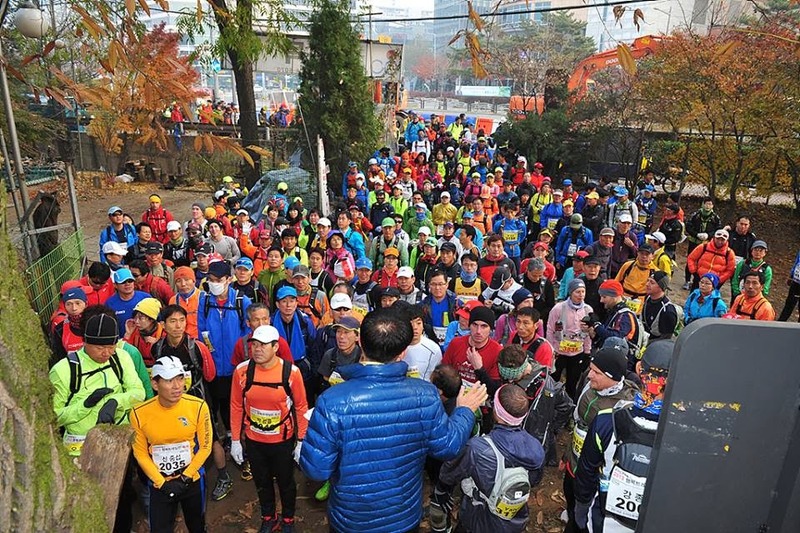 Like I said, I have never experienced anything like the cramps that I had, except at the very end of the 100 km race in Yang Yang earlier this fall. 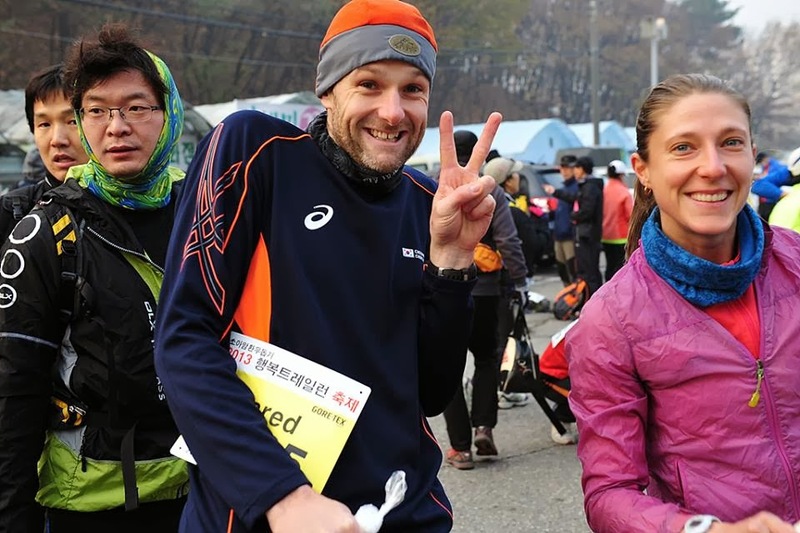 That particular time, I had been pounding out some pretty fast (for me) kilometers towards the end of the race, running at my threshold, when suddenly my calf muscle starting going crazy. During yesterday's effort, I assumed without a doubt that it was a salt issue-- it is conventional wisdom to associate cramps with an electrolyte deficiency. But in retrospect, I think it was mainly that I went too hard early in the race. In my original calculations, I thought I could hang on going that hard for 30km. It was really an experiment because I've never pushed it with that kind of intensity for that much distance combined with elevation gain. Even though my energy and my cardio seemed to cope well with the effort, my leg muscles were telling me a different story. Lesson learned. 30km with that kind of elevation profile does not (yet) allow me to go hard from the start. Another lesson is to bring salty foods with me. I read this fascinating article by Joe Uhan at Irunfar that refutes the benefits of salt intake on sodium stores in our blood during runs; but says that when our tongues taste salt our brains reduce the cramping. Sounds a bit crazy? Read the article. All in all very happy with the overall effort, do not regret a thing, and feel like I've just banked a tiny smidgeon more of that golden trail wisdom. Peace! It would be interesting to do a 30 km loop at high intensity again, just to see how far we could go before the cramps set in. And then, of course, to have some salt tabs on hand should we need them. The other question is maybe should we have had some saltier refueling foods? Nice race report, J. Thanks, Tibbets! Yeah, it really is a new realm. I think we'll have to start stepping up the intensity on the longer runs to condition for the faster speeds. 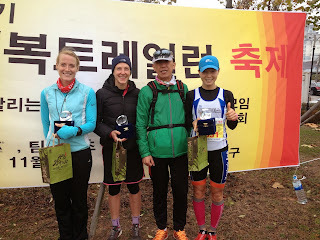 Did you read the article linked on Irunfar? It is interesting in that it claims the taste of salt may be more beneficial than salt itself. Uhan calls it "plying the Internal Governor".